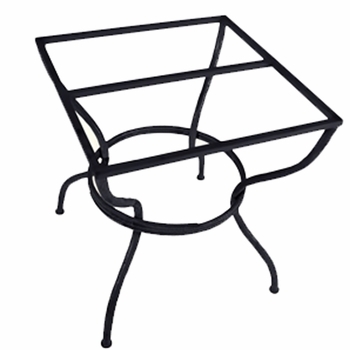 Sized to fit a 30" diameter top, this sturdy iron table base will support glass, wood, copper, granite or marble. 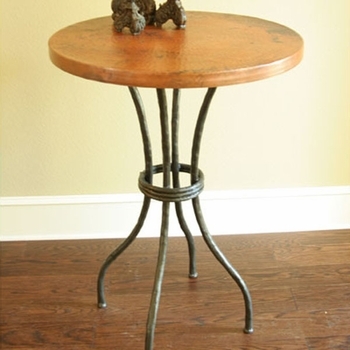 This piece is sold as a base only - the top is not included. ~ Offering our pieces as base only, allows you to use your own top or to select from a variety of tops to better match your decor. If you need a top for your base If you need a top for your table base take a look at our complete Bistro Tables or view our Table Top Collection. Finish: Available in a variety of finish options. Click on view options tab for more information. Black is the standard finish. Premium finishes are available foe an up-charge in price. Select the photo for more detailed information and enlarged views. Hand crafted with an industrial flair designed to accentuate the process of construction and create a clean, rugged and primitive appearance. Some customization is available for an up-charge in price. When we confirm your order we will email you an expected shipping date. If you have questions please call 866-Get-Iron or email us. In order to provide our customers the widest assortment of iron furniture and decor, Iron Accents provides services under which order and delivery times vary. Some items we sell are made and or finished to order and some are brought in only as they are ordered.